Imported from Spain and made from enameled steel, this paella pan is the perfect for making and serving delicious paella. The enameled pans are made of steel and coated with black and white speckled enamel giving the ease of care and rust proof qualities of stainless steel pans but at a fraction of the price. Cleaning is a snap requiring only soap and water. Their performance is equivalent to the carbon steel or stainless steel pan. The pan can be used on a stove top, oven, gas barbeque grill or open flame. For best results, it can be used over a paella burner (also available for purchase). The paella pan is shallow and has sloping sides, which helps the rice cook evenly and develop more intense flavor. As the pans get larger, they grow in diameter rather than depth, which allows for more delicious socarrat, which is the term used in Valencia to describe the delicious caramelized crunchy rice crust which forma the base of any good paella. An Enameled Steel Paella Pan is quite easy to use and maintain, with the advantage over a carbon steel one of not rusting and therefore requiring less care. It can even survive a dishwasher, although they will last longer if hand washed. For everyday cleaning of an Enameled Paella Pan, hand washing in hot, soapy water and drying it thoroughly with a soft cloth before storing is recommended to maintain the best appearance of the Pan. Since the exterior glaze enamel is kiln dried at 1,600° Fahrenheit, the surface is rather resilient and can even be scrubbed with a scrubber of steel wool to remove dried-on or burnt food. Another excellent cleaner for keeping the interior and exterior of the enamel shiny is Soft Scrub Cleanser. 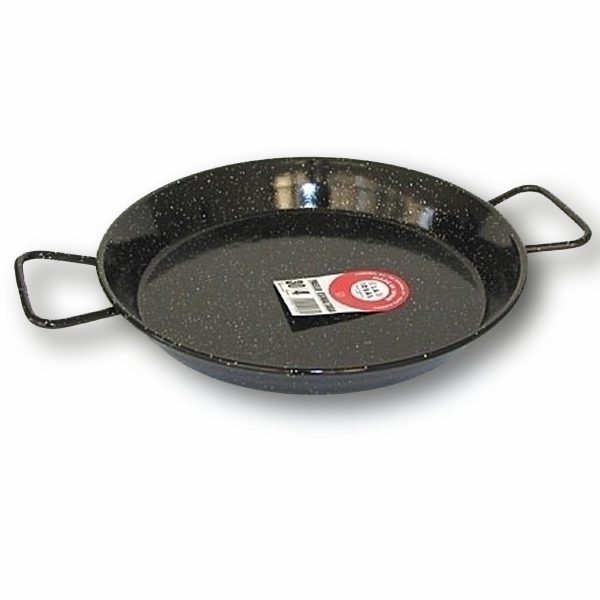 Unlike a Carbon Steel Paella Pan, an enameled one does not require any special curing or seasoning. I actually bought these to test out in our restaurant and both our cooks and customers LOVE them! You gotta try them. I`ve been making paellas over a year now. I learned from a spanish friend. Paellas, valencia style, should be made with very hot fire (direct over fire) traditionally using wood, but I use my gas grill. this means food and rice WILL stick to 99% of paella pans sold in amazon. with these enamel paellas, no matter what you do, nothing will stick. so these are the real thing, what you would get if you order in a spanish restaurant. We are delighted with our paella pan. We hosted several other couples to a memorable dinner and the paella we put together in our paella pan was a wonderful surprise to several of them. It brought back memories of the past for some and for those to whom this was a new experience, it introduced them to one of the delights of another culture. The presentation of the colorful, aromatic paella was greatly enhanced by the pan.